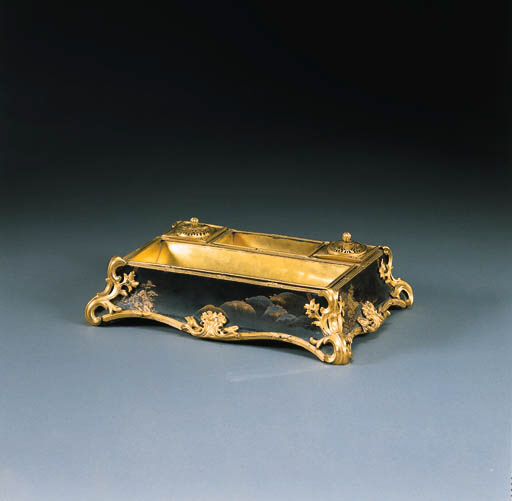 An inkstand of this model also covered in Japanese lacquer in the Wallace Collection, London is discussed P. Hughes, The Wallace Collection, Catalogue of Furniture, London 1996, vol. I., pp. 320-322, No. 78 (F. 109). Stamped with the 'C' Couronné poinçon, it serves to date this model to 1745-1749. Another lacquer inkstand from the San Donato sale was sold March 24, 1870, lot 294. A slightly larger inkstand of this model but veneered in floral marquetry was sold from the collection of Lady Foley, Christie's, London, March 17, 1960, lot 28. A related lacquer inkstand was sold in the sale of the collection of Madame Monvoison, January 20-21, 1845 described as '75 Encrier en laque noir à dessins d'or, garni en bronze doré'. For a discussion on the passion in 18th Century France for objects reusing imported lacquer and the marchand-merciers' role in meeting that demand see J. Whitehead, The French Interior in the 18th Century, London, 1993, pp. 185-189.